How are TV homes growing if pay TV is shrinking? The number of TV homes has grown by over a million. At the time, the number of pay TV subscribers continues to shrink. 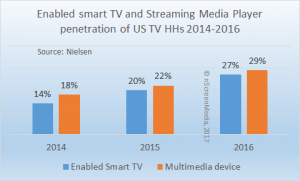 Where are the new TV users coming from, and what are they watching? Nielsen reports that the number of TV homes has expanded to 119.6 million for the 2017-2018 season. For the 2016-2017 season, Nielsen said there were 118.4 million TV homes. 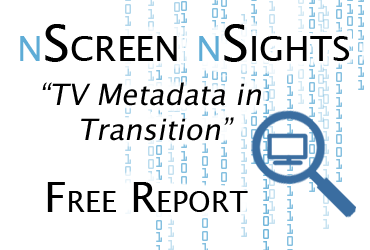 Between 2011 and 2013 the number of TV homes contracted. As televisions households continue to expand, the number of homes with pay TV continues to decline. The number of pay TV subscriptions in the U.S. has fallen from 104.1 million in 2010 to 98.7 in 2016. Two-thirds of the decline came in the four years between 2013 and 2016. Does this mean there has been a big increase in television sales over the period? Not really. 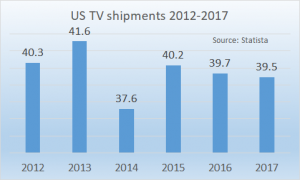 Television shipments in the U.S. have remained at about 40 million a year for the past six years. Shipments even declined a little between 2015 and 2017, from 40.2 million to 39.5 million. So, if television sales have not increased and pay TV is declining why is the number TV homes growing and what are people watching? What are the new TV homes watching? The second source of content for these new television homes is good old antenna television. Between Q1 2015 and Q1 2017, the number of homes watching television with an antenna increased from 12.5 million to 15.2 million. However, almost all the increase in antenna homes came from homes that also have broadband. In those home, it is likely people use both broadcast television and streaming services on the big screen. Why did the number of TV homes increase? It could be that people are just keeping their television sets a little longer. Streaming media players are a cheap way of watching streaming services on non-smart TVs. They are also a great way of getting all the latest apps on an older smart TV that may not be able to deliver a good experience with the latest apps. For those who are returning to antenna television, there simply isn’t any reason to upgrade the television. Any set made in the last ten years should do a creditable job of delivering a good picture. 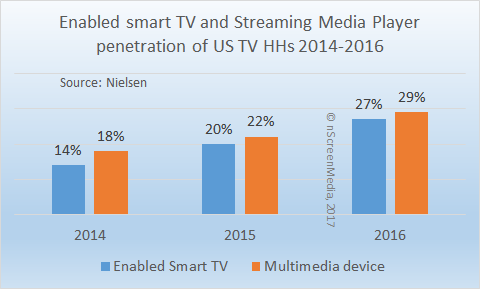 If people are keeping their existing TV sets a little longer, that would explain why TV households increased while the number of TVs shipped did not. 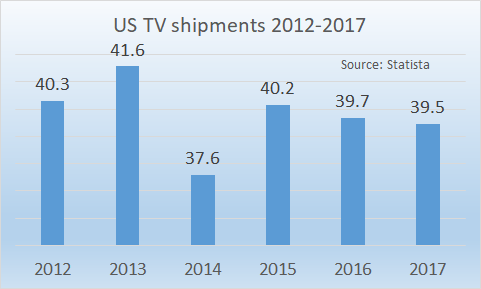 TV homes increased 1.2 million in the last year, while TV shipments have remained essentially flat for the last several years. Pay TV subscriptions have declined over 5 million since 2010. More people are watching streaming services an antenna television. People may be keeping their TVs longer, using Rokus and Chromecasts to revitalize their aging sets. ^Streaming media players are called multimedia devices by Nielsen.